The image above is a stunning view over what was once one of Australias most important industrial sites. Producing iron and steel for the Australian market, and using local ore and coal, the iron works were a major part of Australian industry. What’s more, the iron works was one of the first iron working sites in Australia, making it a significant pioneer of the industry. Today, the Lithgow Iron Works are in ruins, but once, they were a thriving industrial centre, and an important employer. They were even the site where Australia’s first steel was produced! Although the image shows the 20th century iron works, the history of iron working in Lithgow dates back to 1875. Iron ore had been discovered in Lithgow, on land belonging to Enoch Hughes. Soon, a small iron works was established to extract the metal and by 1880 the Lithgow iron works was producing enough pig iron to create four miles of rails for the railway each week. In 1901, the son of William Sandford, who was the primary owner and manager of the iron works and Eskbank Colliery, successfully produced a viable amount of steel. Tapping steel was a major success as iron and steel was basic necessities for many other Australian industries and Sandford believed the quantities made needed to be increased. In 1901 he bribed parliamentarians to win a tender to supply iron and steel. Part of the deal made at this time was the construction of a new blast furnace – the furnace in the image above. The new blast furnace was ‘blown in’ in 1907, but by this time Sandford was financially and mentally stressed. In December of 1907 the bank foreclosed on the iron works, and the Hoskins brothers soon took over the company. They extended the government contract to produce iron and steel to the end of 1916 and soon the site was so successful that 80 coke ovens and a second blast furnace were added. Yet the blast furnace and iron works at Lithgow were not to be long lived. By the mid 1920s it had been decided to move the iron working operations to Port Kembla, as the access to transport and natural resources was better. The blast furnace site in Lithgow closed in 1928, just 21 years after it had been blown in. This week, with the holidays rapidly approaching, it seems the perfect time to turn attention to one of the many attractions not far from Sydney. The Scenic Railway is a popular place for tourists to visit, and today is a reasonably comfortable, safe and not particularly terrifying ride. 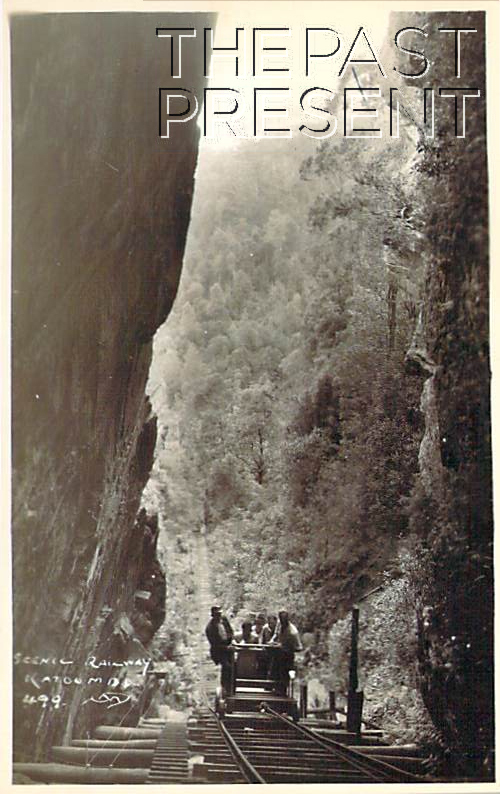 The historic and unique railway has quite a history though, and in its early days, as the postcard above demonstrates, was quite a different ride. The Scenic Railway may be today a historic ride, but it was a working railway for the mines which were once situated at the bottom of the escarpment. By 1878 the mines, which mined not only coal but also kerosene shale, were in full operation and a system of cable tramways serviced them. The scenic railway we see today was one of these, carrying the mined materials to the summit of the mountain where they were transferred to another railway to be taken further, to local businesses who purchased the coal, and also to markets in Sydney. Even before Scenic World was created, the railway carried more than just mined materials. Many miners caught a lift up from the mines in one of the coal carts, and later on weary walkers would also make the journey. A 12 seater car was built, named Jessie, and this was used on weekends and public holidays to carry passengers, even while the mines remained in operation.The car only carried 12 people, and rides cost sixpence. During the Second World War, American troops on leave heard of the railway and came to the Blue Mountains to visit and ride the engineering marvel. In fact, it was while Harry Hammon was loading coal for transport to Katoomba that he met up with a group of American soldiers. They had come to see the railway, and were disappointed to discover that it was only run on weekends. When the mine closed, Hammon and his sister Isobel Fahey took over the lease and began to operate the railway as a tourist attraction. This week, The Past Present decided it was time to again investigate an historic location outside of the Sydney area. Australia is full of historic towns and even isolated places and buildings have their story to tell. Lithgow, which many Sydneysiders are familiar with, is one of these fascinating historic places, and looks at once similar and yet markedly different to the view captured in the postcard above. Lithgow, which is named in honour of Governor Brisbane’s private secretary, was named in 1827 by by Hamilton Hume, just three years after the first Europeans arrived and settled the valley. Yet settlement in the valley was slow, and by 1860 only four more settlers had arrived. In 1869 though, the Western Railway Line (using the famous Zig Zag Railway) was built to Lithgow and the area quickly grew. With a combination of coal fields and easy transport by rail, various industrial workings soon began to appear, and the already established woollen mills prospered. In 1875 a Blast Furnace was built and by 1900 steel, the first to be smelted in Australia, was being produced. A meat refrigeration plant was also established in 1875 and soon there were breweries, brickworks, copper smelters and even pipe and pottery workings established in the valley. In the early 1900s a small arms factory was also added to the vibrant working town. Today, most of these industrial workings have long since closed, becoming historic sites rather than booming businesses. 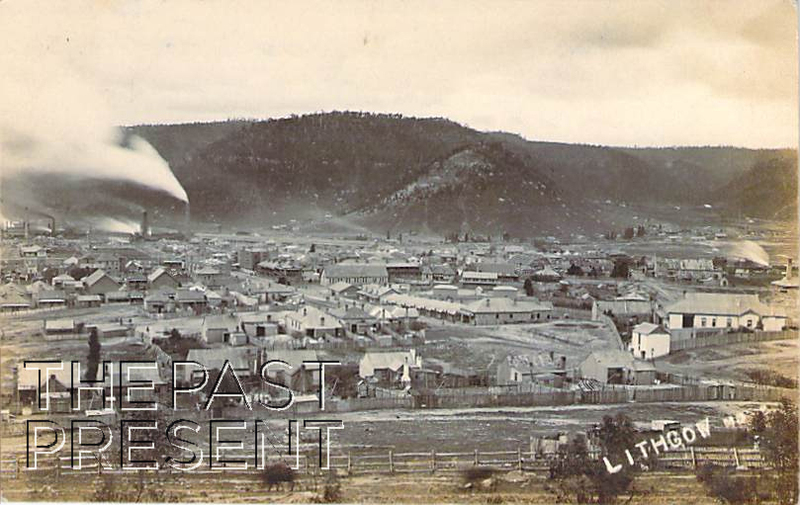 Yet the postcard above captures Lithgow in its industrial heyday, including the plumes of smoke from the smelting works which would once have been such a part of the skyline.